Loughgall manager Dean Smith. Pic by INPHO. Loughgall’s memorable Irish Cup march now stands one win away from a landmark final appearance on the knockout showpiece stage - with manager Dean Smith keen to maximise every step between now and the March 31 semi-final. Tuesday’s rearranged quarter-final ties resulted in wins for top-flight Coleraine and Cliftonville, plus left Larne alongside Bluefin Sport Championship colleagues in the last-four draw. The draw provided Loughgall with a semi-final test against Cliftonville on Saturday, March 31 in a repeat of the 1997 clash that marked the Villagers’ previous adventure towards that coveted stage of the high-profile cup competition. Although attention around the club may naturally centre on the Cliftonville challenge, Smith is demanding full focus from his players on the two league games before a return to any dreams of another senior cup scalp. Loughgall make the short trip to Shamrock Park tonight (Friday) for another derby league date with Portadown, having failed to pick up anything from this season’s previous four games. Then Harland and Wolff Welders arrive in Loughgall on Friday, March 23 for the final game ahead of Cliftonville. Loughgall’s fixture list following confirmation of a post-split top-six spot in the league standings may have been included cause for celebration in the Irish Cup over Ards and Glenavon but only a point as the sole return from the four Championship games. “If you start resting players and things like that, in terms of mentality, it can take them a bit of time to get up and running again,” said Smith. “We will look at certain things and take into account suspensions but for me it is just about how, as a player, I liked to play week in and week out and was not one who was great about having a rest. “The draw is what it is, it would have been great to have drawn Larne and have at least a Championship team in the final. “Two teams in the semi-finals from the Championship shows how strong the league is. That 1997 semi-final finished in defeat for Loughgall to Cliftonville but Smith is refusing to add extra weight to this year’s competition with too much talk of the past. “For us it is about going out and enjoying the day,” said Smith. “It is a big day for the players and the club and we make no bones about it, again it is the same scenario for us as we are hoping Cliftonville have a poor day at the office and we have an exceedingly good one. “That has to happen for us to get anything from the tie. “Cliftonville have firepower and with the squad they have in general they are going in as red-hot favourites. “I suppose it is great in that you have nothing to lose and Cliftonville and Coleraine will be wary that the teams they are playing have proven their mettle. “Not everyone can get into a cup semi-final. “But Barry Gray as a manager is long enough in the tooth not to take any team for granted and will do his homework on us for Cliftonville. “Come gameday he will have the team set up in a certain way to try and beat us, as we will. 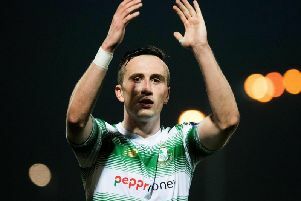 “When we beat Ards I know it was a bit of a freak game on the day as they had three players sent off but I do not think we got enough credit when there were 11 players against 11 as the better team,. “Against Glenavon we were the better team in the first half, they put us under a bit of pressure in the second but did not really open us that many times in the second half. “We will take credit from that, we have kept two Premiership teams at bay for over 180 minutes and we will take confidence. Loughgall supporters will be seated in the Main Stand at The Oval, with tickets available soon via the Ticketmaster website at £14 and £8. Kick-off tonight will be 7.45.